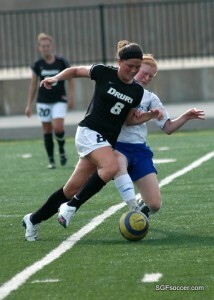 From the DruryPanthers.com website – Rockhurst struck for two goals in a six-minute span in the second half to charge past Drury for a 2-1 victory in their Great Lakes Valley Conference women’s soccer match Sunday afternoon at Harrison Stadium. 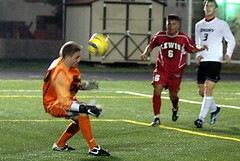 The Hawks improved to 4-2-1 overall and 2-1-1 in GLVC play, while Drury fell to 3-4 and 1-3. The Panthers went on top first on a goal from 10 yards out by sophomore Kelly Gallagher at 29:09, her second on the season, with junior Nicole Williams picking up the assist. But, trailing 1-0 at the half, the Hawks went on the attack in the second half. Haley Long – the younger sister of DU senior Kelsy Long – scored from 15 yards out with an unassisted goal at 60:01, and Margaret Rubin followed with another off a Danielle Boyce assist from two yards out at 66:59. Rockhurst keeper Lucy Sullivan and the Hawks shut out the Panthers from there in a match that saw the teams fire off 11 shots each. 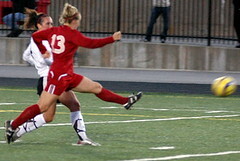 Sullivan and DU keeper Jessie Sanderson were credited with five saves apiece. Drury is back in action next Friday at Harrison, playing host to Maryville in a 1:30 p.m. GLVC match. 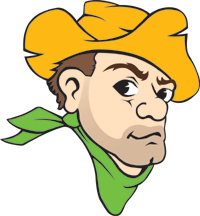 (NOTE: Sunday’s match was televised by Mediacom-22 on a tape-delayed basis, with replays to run on Monday (2 p.m.), Thursday (2 p.m.) and next Sunday (6 p.m.). In each case, the broadcast will start with the replay of the DU-Rockhurst men’s match won by the Panthers 3-2 in two OTs). Congratulations to Chloe Moushey, Senior defender for the Drury Panthers, who was named to the ALL-GLVC FIRST TEAM today. 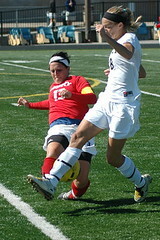 Chloe is pictured in red, defending against Lewis earlier this month. The entire group of selectees can be seen here. 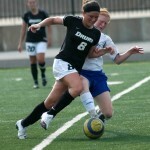 The Lady Panthers clinched a GLVC playoff berth with their win tonight at home. The teams were tied at the half as neither team could develop a rhythm, or maintain control long enough to score. Drury broke through in 52nd however when Nicole Williams ran onto a long ball from Kelsy Long and put a well-placed shot under the charging goalkeeper and into the far side netting. The Flyers tied it in the 76th and were applying pressure until William’s got the game winner in the 82nd. This time it was winning a foot race for a loose ball, carrying it from right to left into the box, where she buried her shot into the upper 90 (pictured) at a full run. Sweet. The Panthers faced the #21 ranked Flyers this evening and started as well as you could hope, when Marco Cherisma scored on a blast from just inside the box in the 2nd minute, after receiving the ball from Andre Bordelon, who had beatem his man on the right side. It was a back-and-forth affair this evening, with both sides creating numerous chances (see below). In the end, it was the Flyer’s two front runners who earned the points for the visitors. Nestor Hernandez got to a loose ball in front of the goal in the 60th and Cory Mastey sealed the win in the 86th minute with his goal. 4th Flyers get two chances on corners – 10th Steve Wilczewski’s shot pushed just wide – 19th Wilczewski breaks in from the right side, two shots blocked in front of the net – 31st Bordelon unmarked on right, cuts left in front but his shot is saved – 32nd GREAT reaction save by Logan Hoffman (pictured) on a Lewis blast from the spot – 38th Marco Cherisma goes out – 47th Drury clears two opportunities from in front of the net – 60th Lewis ties it, by #9 – 86th Lewis scores, by #16 the other front runner.